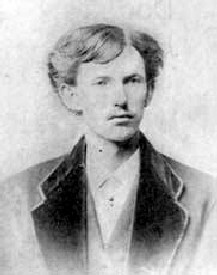 Doc Holliday's father, Henry B. Holliday was a trained pharmacist who served in several wars, including the Cherokee Indian War, the Mexican War, and as a Major in the Confederate Army. After serving in the Mexican War, he returned to his home in Griffin, Georgia with an orphaned Mexican boy named Francisco Hidalgo. On January 8, 1849, Major Holliday married Alice Jane McKay and within a just year had a daughter, Martha Eleanora, who died in infancy. On August 14, 1851, John Henry (Doc) Holliday was born. In 1857, Major Holliday inherited a piece of land in Valdosta, Georgia and moved Alice, John, and Francisco to Lowndes County where John Henry attended grade school at the Valdosta Institute, studying Greek, Latin, and French. Major Holliday quickly became one of the town's leading citizens, serving two terms as Mayor, acting as Secretary of the County Agricultural Society, a Member of the Masonic Lodge, Secretary of the Confederate Veterans Camp, and the Superintendent of local elections. When John (Doc) was just fifteen, his mother died on September 16, 1866, of consumption (later called tuberculosi s.) This was a terrible blow to the teenager, as his relationship with his mother was very close. Compounding this loss, his father remarried only three months later. The family’s status in the community, as well as the fact that his cousin, Robert Holliday, founded the Pennsylvania College of Dental Surgery, probably encouraged John’s choice of profession. In 1870, he enrolled to the college in Philadelphia and on March 1, 1872, he was conferred the degree of Doctor of Dental Surgery, along with twenty-six other graduates. 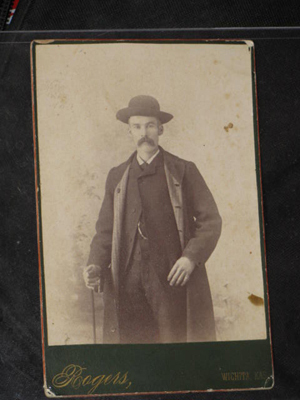 Shortly after graduation, Doc Holliday began work as a dentist in the office of Dr. Arthur C. Ford in Atlanta. Though an educated and respected man, John Henry was a hot-tempered Southerner and quick to use a gun. On one occasion, there were "Negros” swimming in his favorite swimming hole and the outraged Doc started shooting over their heads. While one of the black men shot back, no one was killed. This seems to be the first account of Doc’s love affair with the six-shooter, and the stories of the incident vary. Initially, Doc worked with another dentist by the name of Dr. John A. Seegar in Dallas. However, as the coughing spells wracked his body during delicate dental procedures, his business declined, and Holliday was forced to find another way to earn a living. In 1877, Doc was dealing cards to a local bully by the name of Ed Bailey, who was accustomed to having his way without question. Bailey was unimpressed with Doc's reputation and in an attempt to irritate him; he kept picking up the discards and looking at them. Looking at the discards was strictly prohibited by the rules of Western Poker, a violation that could force the player to forfeit the pot. When Doc arrived in Tombstone, not only did he find Wyatt, but all of the Earp brothers including Morgan from Montana, James, who traveled with Wyatt from Dodge City, and Virgil from Prescott, where he had just been made a Deputy U.S. Marshal. 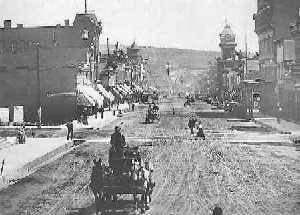 Wyatt and his brothers were mining silver and James was dealing Faro at Vogan’s Saloon. Virgil appointed Wyatt as the acting City Marshal, and also swore in Morgan as an officer.However, the Cowboys were surprised when the Earps showed up, and Doc was with them. As they made their way to the O.K. Corral, witnesses said that the three Earp brothers were all dressed in black with the firm, mean grimaces on their faces while Doc was nattily clad in gray and was whistling. Where the two forces finally met was 90 yards down an alley from the O.K. Corral. The actual gunfight took place off Fremont Street between Fly’s Photo Gallery and Jersey’s Livery Stable. The Earps passed by the O.K. Corral but cut through the alley where they found the troublemakers waiting at the other end. The 30-second shootout left Billy Clanton, Frank McLaury and Tom McLaury dead. Virgil Earp took a shot to the leg, and Morgan suffered a shoulder wound. As Wyatt stood, still stunned, Sheriff Behan appeared advising him he was under arrest. The Earps and Doc Holliday were tried for murder, but it was determined that the Earps acted within the law. 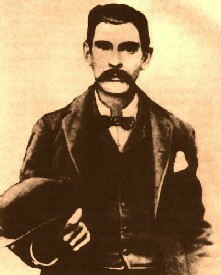 Doc Holliday had come West years before, knowing his days were numbered. He never believed that he would die in bed. He often said that his end would come from lead poisoning, at the end of a rope, a knife in his ribs, or that he might drink himself to death. Holliday’s health continued to deteriorate. As a realist, Doc was not one to believe in miraculous cures, but hoping that the Yampah hot springs and sulfur vapors might improve his health, he headed for Glenwood Springs, Colorado in May 1887. Registering at the fashionable Hotel Glenwood, he grew steadily worse, spending his last fifty-seven days in bed at the hotel and was delirious fourteen of them. On November 8, 1887, he awoke clear-eyed and asked for a glass of whiskey. It was given to him, and he drank it down with enjoyment. Then, looking down at his bare feet he said, "This is funny", and died. He always figured he would be killed with his boots on.